Clearing firms and RIA custodians have morphed into technology companies concentrating on deeper integrations with third-party solutions. Boston, August 4, 2016 – As core clearing, settlement, and custody services have become commoditized, technology is now a major differentiating factor for clients seeking a provider. U.S. correspondent clearing firms and registered investment advisor custodians providing these services have become technology vendors in and of themselves. But can these firms’ technology arms race also change the way traditional advisory services are delivered? This research explores market forces impacting correspondent clearing firms, RIA custodians, and their wealth management clients; sizes the market; and overviews leading providers’ recent and planned technology enhancements. These providers include Apex Clearing, Charles Schwab, Fidelity, LPL Financial, Pershing, and TD Ameritrade. 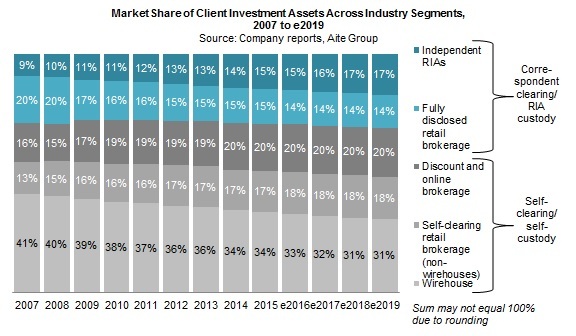 It is based on 2015 and 2016 Aite Group interviews with and platform demonstrations from leading correspondent clearing firms and RIA custodians. This 41-page Impact Report contains 12 figures and eight tables. Clients of Aite Group’s Wealth Management service can download this report. This report mentions Advent Software, Albridge Solutions, Ally Financial, Altair Advisers, Apex Clearing, Auerbach Grayson & Co., Avier Wealth Advisors, AXA Advisors, AXA Equitable Life Insurance Co., Ayco, Betterment, BlackRock, Broadridge, CAIS, Cambridge Investment Research, Charles Schwab, Commonwealth Financial Network, COR Clearing, Cowen and Company, DocuSign, eMoney Advisor, Envestnet, E-Trade, FA Insight, Fidelity Investments, Fifth Third Securities, Finance Logix, First Clearing, Frontier Wealth Management, Geneva Advisors, Goldman Sachs, Halbert Hargrove, Hilltop Securities, Invesco, Jemstep, Junxure, Key Investment Services, Laser App Software, Laserfiche, LPL Financial, Mariner, Marstone, MoneyGuidePro, Morningstar, National Financial Services, NaviPlan, Nepsis Capital Management, Northwestern Mutual, Orion Advisor Services, Peak6, Pershing, Raymond James, Redtail Technology, Robinhood Financial, Royal Bank of Canada, Salesforce.com, Scottrade, SigFig, SMBC Nikko Securities America, State Street, Stifel Nicolaus, SunTrust Bank, SunTrust Investment Services, TD Ameritrade, The Colony Group, TradeKing, U.S. Department of Labor, U.S. Securities and Exchange Commission, UniCredit Capital Markets, Vanare, Vestnomics Wealth Management, Wealthfront, and Wedbush Securities.